61 years ago, the executives of Wham-O Inc. acquired the rights to a flying disk they called the Frisbee®. Now, the same company claims it’s reinvented the damn thing with a wobbly-looking toy called the Frisbee Sonic. It being 2018 and all, the new invention is being funded on Kickstarter. Oh, and I hate it. It feels like a cheap trick. 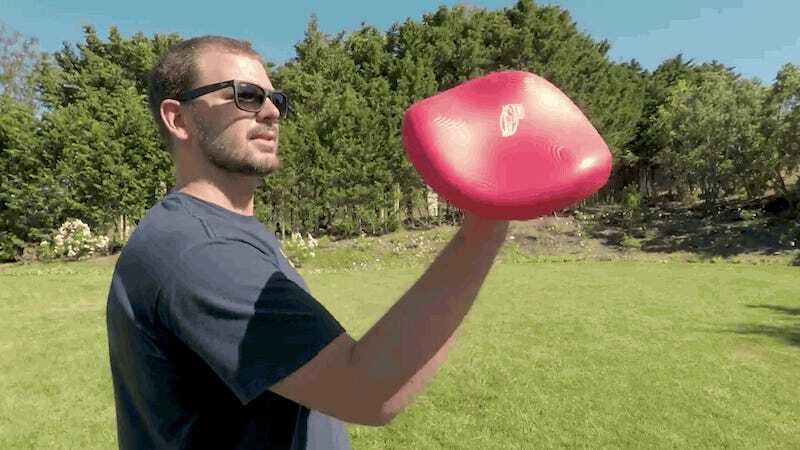 Take one of the most iconic American toys, twist it up a little bit, and wham-o, it’s “reinvented.” The Kickstarter campaign even advertises the Frisbee Sonic as the “‘square’ Frisbee” that’s “easier to hold and to throw” and even better for your dog. There are actually eight selling points in all listed on the page, which forces you to consider how insufficient the classic Frisbee really is. Or maybe the better question: How insufficient are you? I refuse to cooperate with any of these post-capitalistic marketing gimmicks. Kickstarter used to be a place to donate money to weird art projects, but increasingly, it’s becoming the testing ground for larger companies like Wham-O to test the market for half-baked ideas. That’s exactly what the Frisbee Sonic feels like: something the company didn’t want to commit to. It might also be something that was close to a final design, but needed a little test run on Kickstarter so that Wham-O could work out the kinks. Given the fact that its goal was only $5,000, the Frisbee Sonic is nevertheless almost certainly going to get made. Depending on how much money it raised in total, however, there’s a chance it might be a limited run. This is not to say that Kickstarter or Kickstarter projects are bad. Lots of great companies got their starts on the platform. Oculus is perhaps the biggest success story, after Facebook bought the Kickstarter-funded company for $2 billion back in 2014. There’s something sort of inspirational about a whole company turning to the world and saying, “Fund me and my great ideas!” But that’s not what’s happening here with Wham-O. This is the 70-year-old company behind not only the Frisbee but also the Slip ‘N Slide, the Super Ball, the Boogie Board, and Silly String. The company needs a new hit, and frankly, it’s not so sure about the new Frisbee Sonic, so can you please give it some money to show your support? You might be one of them. If so, good luck. I not only hope that the project gets funded and you receive your Wham-O Frisbee Sonic in the mail, but also that your Wham-O Frisbee Sonic is loads of fun and good for your dog. What I’d love more, however, is for Wham-O to make something completely new and incredible. Innovative companies don’t reinvent their best sellers. They create exciting new things we normals could never even dream about, things like Silly String and the Boogie Board and the Super Ball and the Slip ‘N Slide and the Frisbee. Also the Frisbee was already reinvented in the 1980s, when an engineer came up with the easy-to-throw Aerobie. Those flying rings actually featured a lot of the same upgrades that the Frisbee Sonic advertises, some 30 years later. Maybe all of that classic American ingenuity flew out the window around the time Bill Clinton won the White House. Before then, we didn’t really have the internet, and we certainly didn’t make new products by begging internet users for money. It was a simpler time, that I don’t miss. I do miss feeling impressed, though.